I followed my ears to the gym to watch a Steady Buckets practice. The sound of the dribbling balls thumped with all the energy and noise of a lively drum circle. Emily Faulkner, the Alexander Technique instructor, greeted me with an enthusiastic smile and guided me through onto the other side of the court. A 17-year-old rushed to her, put down his ball and pulled up a chair, ready like he's been taught to do every week. A kid about age 7 froze for a second to get a glimpse of Faulkner preparing to work with her student before resuming his playing. I didn't know what was going to happen, but as Faulkner prepared, she had already piqued my curiosity. As the young athlete caught up with Faulkner about how his games had been going over the week, she took his head and pivoted it left and right, like delicately screwing in a light bulb. The longer she continued, he visibly quieted bringing himself to a new level of consciousness. He then stood and sat in and out of the chair. He bounced up and down and let his joints drip down. She manipulated his elbows, moved his knees and stretched his hip joints. After several minutes, he took his first whole steps. He walked awkward at first, stacking himself piece by piece. She worked a little longer finding the ins and outs of his joints, and after re-finding himself like a puzzle, he picked up his ball and ran back out onto the court, smiling and complete. Macky Bergman is the coach and one of the founders of Steady Buckets basketball training. The afterschool outreach program encourages technique, community and leadership in boys and girls of all ages. Based in lower Manhattan, the kids come afterschool from different teams to work together to have fun and hone their craft. Everyone in the room is committed to improving their game, and the motivation from one player to the next seems infectious. Faulkner met Bergman as a parent of a former player. When Macky found out Faulkner was an experienced and talented instructor of the Alexander technique, he jumped at the chance for his students to supplement his drills with her instruction. The Alexander Technique is a system that breaks down movement and brings awareness to the body. Both Bergman and Faulkner believe that for their purposes, "form is more important than making the shot." By deprioritizing the goal of the movement, practitioners are able to examine the motion and body itself. "The Alexander Techniques gives the body choices", Faulkner says of her work. As a dancer and choreographer, she herself found the technique to be helpful in her improvisational practice. From watching her work with the athletes, the attention to various points on the body is so acute that a person can't help but to investigate themselves, and they were doing it through sports. Next in the chair was a young high school girl. More rigid than the previous boy, she waited to be softened. Faulkner took her by the jaw line and moved her. The girl found her way to a perfect profile, bringing a stone focus and calmness to the rest of her body. Emily brought the girl's hands into her own and lengthened her fingers not with tension, but with intention. Together they created a gesture full of resistance and Zen-like awareness that carried all the way into her shoulders. I watched the girl seemingly learn the place of her fingers in their sockets, and find connection between her elbow and fingertips. Finally, her shoulder blades were placed along her back, and the girl allowed herself to move again. Faulkner took a small break to tell me more about the Alexander technique. She explained that the method is habit-changing. It is there to aid in perfecting technique, correcting what the body has learned incorrectly. Says Faulkner: "People think standing up straight is rigid and uses extra force but it's easy, peaceful, and a good place to move from." She has seen this technique used to help not only athletes and dancers, but as therapy for everyday people who want to make positive adjustments towards healthy movement. People with orthopedic and therapeutic concerns, with back pain and carpal tunnel syndromecan turn to this creative and fun method for support. The final player for Faulkner was a 24-year-old college student. They had worked together for a year and were happy to see each other. As they spoke she began to walk him through the exercises. The athlete kept mentioning how important the mind was to using the Alexander technique; that mind over matter was important to build that relationship of curiosity and development in the body needed to benefit from the practice. Finished with the chair, he stood upright. Towering a whole head above Faulkner, she talked him into awareness in the feet, how he balanced from one foot to the other, how to ground himself into the floor. She placed a hand lightly on his collarbone and walked with him across the floor, slowly leading him through the parade of children running drills. His steps became lighter, more assured as they made their way. On the other end of the court, the two fist-bumped and returned to their tasks, both a little taller. The focus of everyone that went to Faulkner's chair was the same focus I saw on the court. The habits these young athletes were learning showed in the drive and freedom in which they moved. It was a pleasure to witness these children experience basketball in this way and to be made aware of the Alexander Technique. 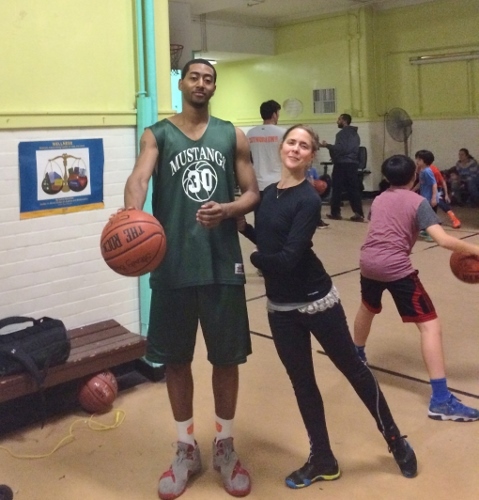 Dance Artist Emily Faulkner and Steady Buckets Basketball Player. Photo courtesy of Emily Faulkner Dance.